Fly Angler's OnLine "Beginning Fly Tying Part 36"
I can't imagine fly-fishing for bass without a few diving bugs in my arsenal. This is one tremendous bass fly pattern. It floats on the surface like any good popper should, but instead of skipping on the surface when the line is tugged, it dives under the surface with a gurgle and a swoosh. Bass are notorious for keying in on sounds. I think that's why poppers are so popular in bass country. But, sometimes something a little more subtle is needed to attract their attention. Maybe a gurgle or a swoosh is what they want instead of a pop. If you add the visual sensation of a fly that dives and then floats back to the surface, you have a winning combination. 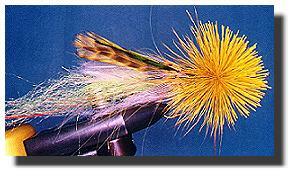 Larry Dahlberg gets the credit for designing this fly. 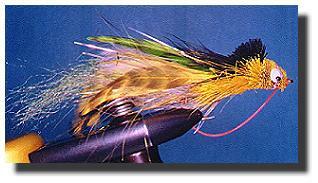 In fact, most folks call this fly the Dahlberg Diver. Being a Wisconsin native, he spent much of his youth and young adult life guiding fishermen for bass, especially smallmouth bass, on his native waters. Since he was a fly fisherman too, he spent many hours and days working on better fly designs that would catch more and larger bass than anything he could find in the fly shops. Somewhere during that time, he developed a fly that would dive when tugged and slide back to the surface when the line was allowed to go slack. If you've watched a frog trying to swim away from you, you know that is exactly how a frog reacts when it swims. And, big bass love frogs. I haven't figured out why this fly works so well in colors that don't come close to frog colors, but it does. Although I tie and fish a lot of divers in frog colors, I also have good success with wild colors like red and white or purple. Since I haven't observed red and white frogs, I must assume the occasional odd color is just enough to trigger a strike when bass are tired of the same old diet of green and brown frogs. Hmmm, maybe a red and white or purple frog might taste better? I've asked the fish, but they haven't issued a formal reply yet. 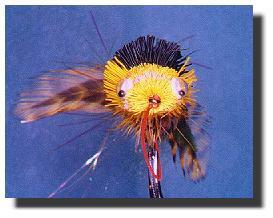 This is another fly that can be dropped into pockets in the weeds with good success. Plop, dive, rise, dive, slam is the usual routine. Let those hardware guys chase little bass in the open water, I like big bass in and near the weeds where hardware is afraid to go. Diving bugs are especially effective in and near weed beds and lily pads where frogs like to swim and hide. They are also good open water searching patterns when everything else you've tried has failed. If you're a serious bass fisherman, you'll do well to make this a standard pattern in your fly box. I'll be using a new material this time. Ronn Lucas Sr. sent me a synthetic material that breathes like marabou but doesn't retain water like marabou does. I placed this around and over the Widows Web material I used for the inner tail. 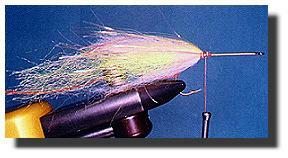 Using synthetics results in flies that are lighter to cast than the originals, and they usually breath as good or better than the natural materials. If you want some of this material and a look at the other unusual stuff Ronn sells, contact him. 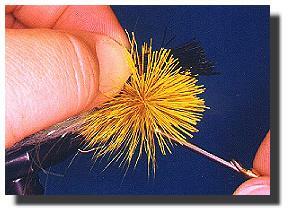 Tail: Traditionally a mix or marabou, antron, crystal flash or flashabou and saddle or neck hackle. This time I'm using a flashy antron type of material called Widow's Web. I also added a wisp of Gocha, a synthetic material that breathes like marabou, but doesn't retain water like marabou does. Yellow flashabou is also added for flash. Feathers were chosen in pairs. 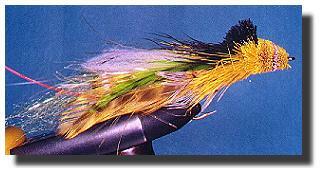 I'm using yellow and green dyed grizzly hackle with a pheasant saddle feather added for color and texture. These are separated into two identical piles with the butts of the feathers aligned with each other; one bunch tied on each side of the hook. 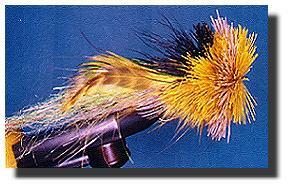 Head: Golden olive, black and natural deer hair; trimmed to a diving bug shape. Many other colors work just as well, so experiment a little. 3. 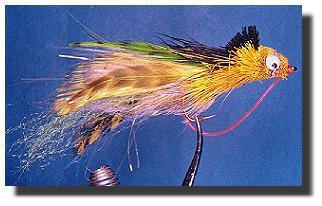 Add the tail feathers like you did in the deer hair bass bug; one bunch on each side of the hook. 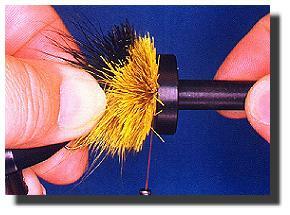 4.Spin a bunch of golden olive deer hair in front of the tail. Be sure to get it tight. 5. Add a bunch of black deer hair right on top of the first hair you used, but don't let it spin. This is called a stacked hair method and is commonly used in clipped hair bodies and heads. It results in a bubble of color in the middle of the original hair color. There are several ways to do this. You can loop the thread around the hair like we did when tying the comparadun wing, then pull the thread down tight. Or, you can hold the hair in place while you make several wraps of thread and pull the thread down tight. The most important thing is that the hair doesn't spin around the hook when you tie it down. Try both ways to see which one works best for you. 6. When you're finished, the stacked black hair should look like this. Notice that it's on top of the other hair, but I didn't let it spin around the hook? I didn't use the thread loop method. I just held it in place while I pulled downward on the thread after making two thread wraps around the black hair and the rest of the hair. 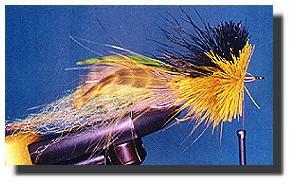 You should use the method that's most comfortable for you and results in a properly tied fly. 7. Spin several more bunches of the original color of deer hair. Pack the hair back after each bunch is spun to create a tight, firm head. If you wish, you can add a band of off colored hair like we did in the deer hair bass bug, but the original didn't have that. 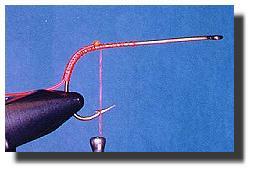 8.When you've finished filling the hook with hair, tie off the thread and whip finish. 9. Start trimming the hair by clipping the back of the head at a 45 degree angle as shown in the picture. Then trim the bottom of the head flat and close to the hook with a razorblade. Finally use your scissors and the razorblade to shape the rest of the head to the shape you see here. The top of the head should be a tight cone shape ending in the abrupt rise of hair on the back of the head where the black hair is tied in to form a hood. 10. Tie in the weed guard and cement the thread, head and hood liberally. You can add eyes if you desire, but the original didn't have eyes. I like Zap-a-gap for gluing eyes on because it dries fast, fills gaps and holds the eyes secure. 11. A frontal view of the finished fly. Hey, it looks like the photographer forgot to straighten the tail before he snapped the shot. 12. From the side, this is another look at how your Dahlberg diving bug should look. Notice the shape of the head? It'll take a little practice to get this pattern down to a science. Don't throw away those rejects though; the bass won't mind if they look bad. Experiment with different colors and tail materials. Try heads with and without eyes. Play around and have fun. If you just can't stand the ones that don't look right, give them to the kid down the street who just started fly fishing. I bet he won't mind a few free flies. The important thing is to practice and have fun doing it. For more on fly fishing for bass, check Al's article in Panfish this week.